For those not in the know and wondering: Hansa is a church. Many of rock’n’roll’s saints and idols have done ground-breaking work in this particular Studio in (West-)Berlin. This is where DEPECHE MODE recorded ‘Construction Time Again’, where IGGY POP recorded “Lust for Life”. Classics such as NICK CAVE’s “Your Funeral, My Trial” and WIRES’s “The Ideal Copy” and hundreds of others were all created here. THE PIXIES, KILLING JOKE, EINSTÜRZENDE NEUBAUTEN, FAD GADGET, SIOUXSIE AND THE BANSHEES, THE PSYCHEDLIC FOURS, ZARAH LEANDER… these are just a few of the names who have worked at Hansa. And, of course, DAVID BOWIE. The walls and carpeted floors of Hansa Studio have sucked up so much rock’n’roll grandeur… it probably only compares to London’s Abbey Road. 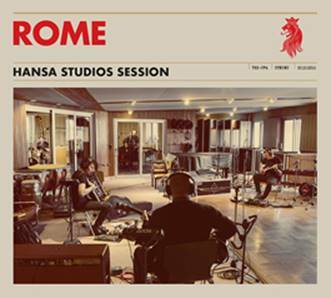 ROME and its entourage set up camp at Hansa for about 14 hours on October 2nd, 2016, and recorded 8 songs in one go. Never really stopping to get a second take, the recording captures the band the way it is – or was at least during that particular tour. ROME hand-picked a few songs from the lengthy tour set, among which are old classics (“Der Brandtaucher”, “A Legacy of Unrest” and “Reversion”), newly arranged versions (“The Torture Detachment”, “Querkraft”), renditions of songs from the latest release “The Hyperion Machine” (“Stillwell”, “Transference”) and one unreleased fine rock raritiy: “Mine”. Responsible for the recording and mixing of this Hansa Session is no one other than Michael Ilbert; the grammy-award-winning Swedish expatriate who has been running his own mixing studio out of Hansa for many years and has done outstanding work in today’s pop and alternative music world.